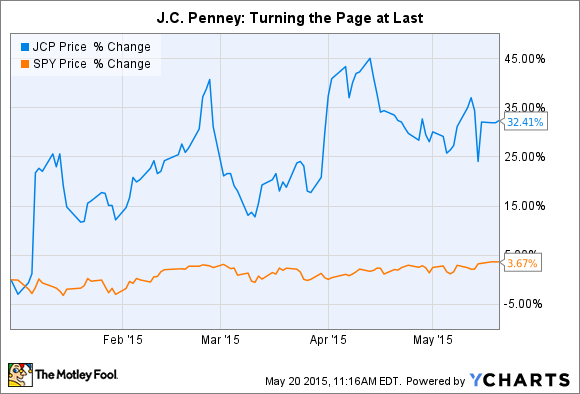 Is J.C. Penney Inc.'s Stock a Buy? It's a new day at J.C. Penney, which has so far proven the naysayers wrong with a turnaround that is progressing faster and stronger than expected. Following J.C. Penney's (NYSE:JCP) first-quarter earnings report the markets have a much better idea of just how well the department store's turnaround is progressing. A full-throated stamp of approval might not be in the offing, but they're clearly willing to say the company is largely out of the woods. BMO Capital Markets recently upgraded the stock to market perform from underperform, asserting J.C. Penney is well on its way to hitting its $1.2 billion EBITDA goal in 2017, but is that enough for investors to consider the stock a buy? When former CEO Ron Johnson sought to remake J.C. Penney into a modern-day retailer, he erred by clearing out many of the house brands in favor of national brands, and one of Myron Ullman's first orders of business upon returning as CEO was bringing them back. That has proved to be a shrewd move that allowed the department store to regain many of the customers it lost in the makeover. Net sales in the quarter rose by 2% ; while that was below analyst expectations, same-store sales growth of 3.4% outpaced forecasts, showing that consumers are responding to the overhaul. Rivals Kohl's (NYSE:KSS) and Macy's (NYSE:M) aren't seeing nearly the same returns. Indeed, Macy's has become so disheartened by its sales struggles that it is looking to cede much of the midtier retail market to its competitors and instead seek out sales in the luxury end of the spectrum. Apparel remains key to J.C. Penney's efforts at winning back customers who fled the chain in droves during its disastrous makeover attempt. That can only benefit J.C. Penney, which fell further and harder than Kohl's did, and its women's and men's apparel have been increasingly strong performers. Together they account for more than half of all the retailer's sales and are on pace to exceed levels not seen since 2011. After just one quarter J.C. Penney is already anticipating 2015 will turn out better than it originally forecast. The retailer has raised the low end of its full-year sales guidance to a range of 4% to 5% from a previous estimate of 3% to 5%, while also guiding gross margin to improve by 100 to 150 basis points over 2014. It can call for higher profit margins because of those enhancements to its merchandise. A year ago J.C. Penney was driving traffic to its stores with clearance sales intended to clean out the racks of slow-moving items, but that hurt profits. Now it can moderate its sales and discount levels while also enjoying the higher margins it gets on its private-label goods. As a result, management expects to deliver earnings before interest, taxes, depreciation, and amortization of $600 million this year. That should grow to $900 million in 2016 and to $1.2 billion the following year. As noted earlier, analysts are beginning to agree this plan is doable. But investors would still be wise to recall the pitfalls that remain before J.C. Penney. Much of the growth is predicated on progressing on the back of an ever-improving economy, so any hiccups that hurt consumers for a protracted period of time will undermine the turnaround in short order. J.C. Penney also carries a heavy debt load that must be serviced through increasing sales. So far, macroeconomic events have played to the retailer's favor, allowing it to leverage its balance sheet to get through the holidays last year. But with $5.3 billion in long-term debt and the prospect for reducing that by at most $500 million by 2017, its burden will remain significant for an extended term . J.C. Penney trades at just a fraction of its sales and a little more than its book value, meaning it offers a significant discount on those bases to either Macy's or Kohl's. Considering its turnaround trajectory has thus far gone in the right direction and exceeded those of its rivals, the retailer looks particularly attractive. It's still recording losses at the moment, but they were seriously narrowed last quarter, and the company plans to be breakeven on free cash flow by the end of the year. After that, management intends to throw off some of that cash toward the retailer's debt. If you're confident the economy is about to crash and burn and take down retailers with it, J.C. Penney at these price levels could be seen as a buy.